Hi! I’m Phil. I’m your host on this site. 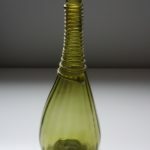 I’ve collected antique glass and stoneware bottles since 1974. 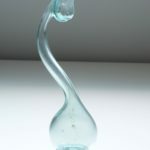 I’ve published both a magazine and several books on antique glass and stoneware here in Canada through the years, and I ran an absentee auction house from about 1993 to 2012. Antique glass and stoneware are basically a part of my DNA. My primary fascination, what keeps me going in the same hobby year after year, is the history. The ability to “reverse-engineer” an appreciation of social history out of a mute piece of glass. 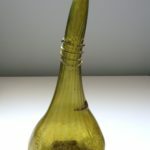 In the case of late Persian glass, I knew nothing – probably less than nothing because most of what I did know was supposition and rumour – about Persia prior to jumping into this area of glass research. I’d say I likely know more than nothing at this point, although the learning curve is still quite steep – which is the part that excites me most. 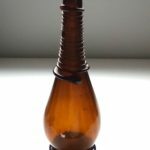 Over the past 40 years, I’ve collected many of the styles of bottles the world has to offer – sodas, poisons, black glass, ginger beers, drugstores, bitters, torpedos, saratogas. 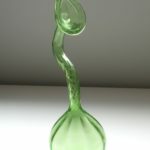 I enjoy good glass (and good stoneware), and I enjoy a good puzzle – most of my collections have led to magazine articles or books. More than simply collecting like objects, I enjoy learning – and telling – the stories of each piece – where and when they were made, who by, who for, and the circumstances of place and time. It’s been a delight to solve the puzzles (as much as each one could be), and then to tell the stories, complete with facts and photos. 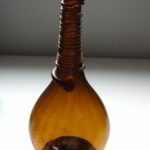 If you share my curiosity about late Persian glass, please do send me a note. It fascinates me to see how much traffic this site garners, from all over the planet, and yet so few people ever write. I’m planning to publish a book on late Persian glass in 2017, drawing from the content on this site as well as other available research. 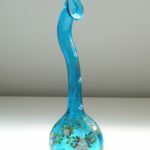 If you can offer any insights, contemporary or current, to this glass, all information is welcome. At this stage in the process, a co-author would be very welcome. And of course, photos and “for sale” lists are always welcome as well. had several of these bottles … brown, clear and aqua. Mine is olive green with many air bubbles. It was the only one with unbroken stringing. It’s nice! I really wanted to know if it is worth much? I remember I paid £7 for it and it survived the long journey back to the UK. Hi Red – I’d love to hear any of what you have learned – and happy to offer help wherever I’ve found something out. First of all, thanks for the very informative blog! I came across your website randomly… I was flipping through a book on Islamic art, and just googled the “rose water sprinkler” that I saw on the book, which was found in Iran… just wanting to know more about it… and thats how I found your website! Super excited I found it! I am currently working on some designs that are Persian inspired… and I think your website will help me a lot! I read on your site that you may want to publish a book on this subject! Well I am a photographer, and go to Iran (my home country) once a year! I would be super happy to help you in your project…either with photography, or anything else you may think I could do. Delighted to meet you, Sara! Like Sara I came across your site at random, in my case when searching for tombak vessels (guess Google lumps everything Middle Eastern). Thanks for a thoroughly informative website. I’ve been looking at Persian glass too, mainly because of the masses of so-called Roman glass coming out of Afghanistan at present. The fact that the Romans never got that far east and that the amount of true Roman glass to arrive there along the Silk Road was limited matters little to most people, so the falsehoods are perpetuated. Some items are certainly Hellenistic era but much seems to be Islamic period, probably (from my limited knowledge) 10th century or later. The whole vessels I see are of Persian style as you’d expect. Anyway, I’ve now been to Iran twice and am aiming for a third visit later this year. 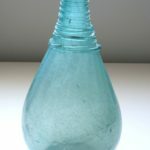 The various old glasswares there fascinate me and your site is a good guide to other things to look for. I started collecting bits of glass/crystal in Syria both as the wife of a diplomat posted there and on return visits as an archaeologist. Material culture fascinates me and your talk of “reverse engineering” is in fact what we archaeologists do all the time. We don’t often have depictions of items to go on either! How the society works tells us about how the objects were used and vice versa. Lots of stuff from both Anatolia and Persia was used in Syria. From what I’ve seen there and collected over time, and learned from people in Iran, I would like to comment on your hookah bases. 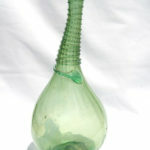 Glass and crystal hookah bases were definitely used in the 19th century if not earlier. Many came from Bohemia. Lots are plain cut crystal or glass but others were flashed. Your bases are more likely about 1930s or so going by the different styles of decoration I asked about in Iran. The same decoration is still applied today. The fact that Nasr ed-Din Shah was assassinated for being too Westernised seems not to matter a jot. When asked, people said they were really honouring a particular traditional decorative style rather than the man himself. This is a lesson to all those studying past material culture. Anyway, I will definitely be looking out for some of the more utilitarian types you have this time round in Iran. I’m taken by gulabdan (rose water sprinklers) and tea caddies but I can see I’ll be looking at other items with much more informed eyes now thanks to your work. I think I somehow missed this delightful post, Mandy. 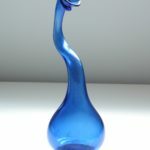 I’ve recatalogued one piece of Late Persian glass as an early crude hookah base, and have added another hookah base that is substantially earlier than the ones on the site. Hopefully one of those areas I’ll catch up on this year. Any other thoughts or comments would be delightedly received!